I used to think startups worked like classical mechanics. In classical mechanics, objects are of macroscopic (normal) scale, and the vectors of these bodies – energy, mass, volume, momentum – exist on curves with each other. Some of these curves are linear, some logarithmic, quadratic, etc. In my working with startups over the last dozen or so years, I have operated under the assumption that team formation, product development, and early traction held characteristics of classical mechanics: they were on some sort of curve in relationship with risk over time. In this model, risk gradually decreases as each of the milestones approaches, and is finally reached. Once the co-founder is selected, a company’s risk profile changed; once the first version of a prototype is built, it is de-risked further; once the product is launched, further still. And finally, when the company reaches product-market fit, or an inflection point where they had discovered a key sticky user feature or scalable distribution mechanism, the risk further lowers. But what if that’s not true? What if risk in company formation does not look like macroscopic, classical mechanics, but rather like microscopic, quantum mechanics? After all, the earliest stages of a company deal with atomic and subatomic units – a single individual, a single feature, a single line of code. Quantum mechanics are different – at the atomic and subatomic level, objects are often part of bound systems, and have discrete, non-overlapping values at which they can absorb and emit energy. What does that mean for company formation? What if risk, as a function of milestones, looked less like classical mechanics, where there can be continuous, curve-like de-risking in time? What if all of the activity that comes along with building a company does not in fact de-risk it? What if product market-fit is in fact the only discrete state in the early stage that de-risks a company? You’ll notice there is no delineation of time in the above chart – that’s because, of course, it’s very hard to know. * Heisenberg noticed something very unique about quantum object properties – that there was an inverse relationship between the location and the momentum of a particle: the more you knew about one, the less you knew about the other. There is inherent uncertainty in measuring time and energy (or in our case, risk). Similarly, in startups, product-market fit is something of a mystery. Slack started as Glitch, an MMORPG computer game, and raised three rounds of funding over a few years before they abandoned that concept in favor of the collaboration software that currently has millions of users and revenues. Facebook, meanwhile, had product/market fit within days, if not hours. The uncertainty over a given timescale is a core principle of startup formation. I now believe that quantum mechanics is the better way to understand the risk trajectory of a company. Here’s where it gets interesting: if the market assumption is that startups de-risk according to classical mechanics, but they actually de-risk according to quantum mechanics, there are points in a company’s lifecycle where the market is inefficient in its pricing the risk. Most notably: once there are ‘milestones’ for a company in the early days, prior to product-market fit, the classical mechanics model would suggest the risk is lower than it actually is. And so the prices for investing in those companies is higher than it should be. And the more milestones the company has reached, incidentally, the less rational the pricing is. Therefore: the most rational seed investment is the price that you would pay at the earliest moment in the company’s trajectory – perhaps the moment the founder commits to the idea, or forms the company. Later in the company’s lifecycle, while still prior to product-market fit, the price, at least as the market currently works, is based on a misunderstanding of risk**. It feels like a trade secret to share this perspective, since it is predicated on everyone else seeing the risk differently. But I suspect it’s counterintuitive enough that I can think out loud. To that point, I am so excited to be spending more and more of my time with people earlier and earlier in their startup trajectory. Extremely talented, passionate, creative people who are at t=0, and in many cases who haven’t yet taken the leap, are my favorite people to work with, and invest in – it is the most rational time to invest in a seed stage startup, after all. *This is where the analogy is weak, because the states at which a particle can absorb and emit energy are not exactly where the time-energy uncertainty principle comes to bear. But that’s why this is a blog post, not scientific paper. **There are enough counterexamples to make a rule, of course. For example, sometimes a team is of such high quality that it becomes a valuable company on that basis alone. Sometimes a product has introduced a technical innovation that is very hard to replicate, which also creates unquestionable value. But in high technology and internet go-to-markets, these are exceptions. When I struck out on my own 18 months ago, I was contemplating a few hypotheses at the same time, but the first was this question: how many of the best founders aren’t in the game or on the bench, but in fact are not founders yet? Put another way: how efficient is the startup formation process? While mission-driven, domain expert (rather, domain insightful) technical expertise is a rare commodity, what if it is not actually the blocker for great startup formation? What if there were an activation energy at which a potential founder could turn into an actual founder, and form an interesting company? Around the same time, Dr. Jeff Wessler, the recently established cardiology fellow at New York Presbyterian Hospital, approached me about an interest he had in tackling heart disease using technology, I’ve known Jeff for 25 years – we played soccer together in our hometown, shared a nerdy fascination with classical music, and in high school worked on biochemistry research. I knew him to have intense intelligence and ambition, but more importantly, a growth mindset – a consistent desire to learn. All the necessary ingredients for a great CEO. He was ready to launch a startup, and wanted advice on where to start. Thus the seed was planted. As we spent more time, and I learned how urgent, expensive, and deep the heart disease problem was – $500B in reimbursement spend a year, 1 in 4 deaths, bigger than all the cancers *combined* – I realized this would be a great place for me to start my own entrepreneurial journey, as a formation-stage founder coach and mentor. After he introduced me to Dr. Paz and Dr. Gupta, I was convinced to help them build something, and we embarked on our experiment to solve for the activation energy, and to create an organization that would tackle heart disease prevention head on: Heartbeat. Right out the gate, we called my longtime collaborator and business partner Steve Jang, who shared my interest in the formation stage of company building, and who had already been doing formation-stage coaching through a number of startups, to see if he’d be interested in joining as the first investor. (He did!) Nayan Jain was tailor-made to be the cofounding CTO, with experience as a founder, mobile engineer, backend developer, designer, and with tours of duty in D.C. health policy, Silicon Valley, health tech and finally New York. Within 4 months of our incorporation, we had launched a clinical practice in Columbus Circle, fully licensed, compliant, and ready to accept patients. We had designed a half dozen iterations of a risk assessment and coaching software, working through the ASCVD architecture, designing our own, experimenting with cluster analysis, and we began the process of integrating off the shelf EMR solutions with our own designs. Fitness, wellness, and primary care have grown in attention across the technology innovation landscape. The care delivery models are shifting towards unbundled, direct to consumer, focused on aligning incentives for the long-term. But specialty medicine has lagged behind. For one: the muscle memory for specialty medicine is different: see your regular doctor, only if she escalates it do you visit a specialty doctor. And if you’re asymptomatic, you don’t go to the doctor at all. So for chronic illnesses, or those diseases that lay in wait under the surface for long periods, prevention is very hard to solve. And for two: the experience has not kept pace with the rest of consumption patterns. People want convenience, digital and on-demand access, and personalization. And cardiology has not exactly been the most forward-thinking industry out there. So we asked: what if you saw your cardiologist the way that more and more women see their OBGYN? What if you could book on your phone, and chat about whatever, whenever? What if you unbundled heart health, allowed for the specialists to have a direct relationship earlier, and focused on digital tools – coaching, remote treatment, a network that meets the patient where they are at, to address the challenges with prevention? Stay tuned for much, much more. Is Chinese Censorship Really About Censorship? For most Westerners, information technology in China is headlined by the fact that it is censored. If you travel to China, you will find that you can’t load a Google map, check your Instagram likes, send your tweets, or even read articles from the New York Times. After the riots in 2009 in the western province of Xinjiang, Facebook was blocked, along with other social media services. Chinese citizens like Wang Yi have been sentenced to labor camps for retweeting comments critical of the Communist government, and dissidents have met similar fates. The Communist Party in China maintains a tight rein over information flows, and it is doing its best to control the fluid and unpredictable nature of social media. But other Western technology companies have struggled in China, too: Uber, once notorious for its ability to muscle a sizable share out of even the most intractable markets, merged with Didi Kuaidi, the Chinese competitor, after finding myriad challenges establishing itself in the country. Amazon, arguably the Western world’s most successful modern company, *lost* market share from 2011 to 2016, while Alibaba, JD.com and other Chinese competitors continued to grow in the double and triple digits. What, then, if the censorship piece—which looks, from a Western, free information, democratic lens, to be a political decision—is not only political, but a business decision, as well? Consider this: The Chinese market is 1.4 billion people, or 18% of the world’s population. As culture, content, and commerce have spread thanks to the Internet and international travel, companies that want to succeed in the long-term have to take a global view. Nobody understands this better than the Chinese government, which has invested hugely in mining natural resources in Chad, Angola, and other parts of sub-Saharan Africa, while dramatically expanding its telco footprint in the Middle East and Northern Africa. The customer base for a company in the 21st Century is not simply those where the company is headquartered. It is, rather, the whole world. The math is simple: Sina Weibo, Baidu, and Tencent—competitors to Twitter, Google, and Facebook, respectively—have an 18% bigger global market of potential customers than their American counterparts, so long as the latter are banned in China. Didi Kuaidi merged with Uber, invested in Lyft, Ola (the Uber of India) and Grab (the Uber of Southeast Asia). Imagine operating as a global company, and having your government actively supporting you not just through tax incentives and diplomacy, but by outright banning your competitors. Whether this is the explicit intention of the Chinese government or not, it is incredibly effective. Whatever your point of view on Sino-American relations, this muscular form of interventionist government—of business development as a form of realpolitik—deserves as much prominence in the discussion around China and the future of technology as political censorship does. It has led to a marketplace where Chinese companies have a structural advantage against their competition. To be sure, political control of business fits tightly into the narrative of a Communist government, and it would be naive to assume that it is *not* about censorship. But Communist governments have censored media in the past. This one feels different: like censorship with business development attached. As for what the West can do in response: Perhaps the answer lies less in igniting a trade war, as President Trump seems bent on doing by slapping tariffs on Chinese-made solar panels and threatening similar action on other products, and more in fostering an entrepreneurial environment that leads to the creation of truly irresistible goods and services. After all, soft power is contagious. There are now tens of thousands of youth in China using virtual private networks, or VPN’s, to post and share on Instagram, a Facebook company. And no wonder. That’s where the soccer players and movie stars and fashion icons are. China is in no position to replicate that. Perhaps free and open society supports a different kind of business, and perhaps that kind of business has something to offer that others do not. Over the long haul, China may have no choice but to move in this direction. Thanks to Rick Wartzman at Capital and Main for editing and publishing me on this one! Whether it takes 15 years or 50, it is almost certain that self-driving cars will be on the road within my lifetime. Waymo, the Alphabet company, is at 3 million test miles driven. Uber, BMW, Cruise (in partnership with General Motors), Mercedes, Volvo, Nissan, Ford, and others have also been logging hundreds of thousands of miles with no one behind the wheel. Tesla drivers, meanwhile, have notched 300 million miles using the company’s Autopilot autonomous driving feature. At the exponential pace of software adoption, the technology is nearly ready for the road. But technological hurdles are one thing; cultural barriers are bound to prove far trickier to overcome. A 2017 study by Deloitte found that three-quarters of Americans do not trust driverless vehicles. The American Automobile Association found that 54 percent of drivers feel less safe even sharing the road with fully autonomous cars. But how safe is safe enough? To better understand this question – the main question causing vexation among insurers and others – think about the psychology of the driver. Implicit in my decision to get on the road and drive is an understanding that there are other drivers on the road, as well. And every interaction with another moving vehicle is an exercise in game theory: that is, intuitively modeling what I expect the other driver to do as a function of what I’m going to do. Yet how does game theory work with a self-driving car? Am I supposed to anticipate what an algorithm would do? Self-driving cars tend to come in fleets. Each one is automatically part of a network of others that share its software. This allows the machine learning processes to run at the rate of *all* the driving data captured by all the cars on the road, instead of just one. This also means that the cars can talk to each other at the speed of a super-fast wireless connection. In an interaction between two self-driving cars, the game theory is not between them, but between the entire fleet and any other entity, since they have perfect information about each other. Imagine being a driver, then, and approaching an intersection where all the cars know exactly what the others will do. Of course, each self-driving fleet will have its own software, and thus far, there is no sign that there will be any integration between different company fleets. So, the likelier scenario is: You approach an intersection, and you don’t know if the cars are talking about you or not. And if they are, what are the saying? Now consider a split-second decision at high speeds, or in confined space. Unnerving, right? Each year, more than 30,000 Americans die and many more are injured in car accidents, the vast majority of which are caused by human error. Driverless cars could eliminate 90% of these deaths and injuries, according to experts. But these numbers—impressive as they are—may not matter very much. The fear of a road full of self-driving cars is a fear that machine game theory, even if it is explicitly designed to avoid accidents, is not perfectly compatible with human empathy. And in the moments of inconsistency, what will the robot do? For example: If there is a chance to protect two pedestrians, but it requires potentially injuring a rider, which does a fleet of self-driving cars choose? What if you’re the one sitting in the passenger seat? Colloquially, ‘what if the software malfunctions?’ gets at the same point. Human malfunction is reasonably predictable. I know that accidents happen when a driver is drunk, distracted, sleepy, or overly upset. But what might cause a machine to crash—literally? Being unable to relate on a human level makes it much scarier, even though the reality may be much safer. Solving the social resistance to self-driving cars (beyond concerns that they could cost millions of jobs) will not come down to safety statistics, or even to miles driven without incident. Those don’t actually matter nearly as much as policymakers and technologists think. Signaling, and communicating a clear sense of fairness – and if not empathy, then something that rhymes with it – will matter much more. They call it a Cambrian moment. These days, every city worth its salt comes with a startup ecosystem: co-working spaces and accelerators mark emerging hubs across the United States and around the world. Since The Social Network, high school students have grown up with the legend of the college dorm room startup as a central narrative. From healthcare to insurance to apparel to food, it seems as though there is a startup for every piece of our economy today, and 10 more behind each one. They seem to be everywhere. In recent years, the number of new venture capital firms has exploded, raising to hundreds of new fund formations a year. My Limited Partner friends tell me they see 300+ new fund pitches per year. Accelerators are rising follow-on funds, athletes are raising side project funds, and scout programs are launching as standalone platforms to fund the early stage. Meanwhile, the late stage has similarly continued on a great fundraising run: there have been multiple multi-billion dollar funds closed, Softbank has committed $200B into the ecosystem, and the middle eastern sovereign capital pools are investing heavily into tech. And there seems to be no end to growth in the space: as global yield stays low, hundreds of billions of assets are looking for a home, and finding promise in the global tech sector. Startups. What’s more, after the global financial crisis in 2008, large corporations had shrunk, Millennials were graduating into uncertain job markets. Youth unemployment was startlingly high, from Spain to Iran to South Africa, and everything in-between. Necessity is the mother of invention. Of course, startups rushed in to fill the void. 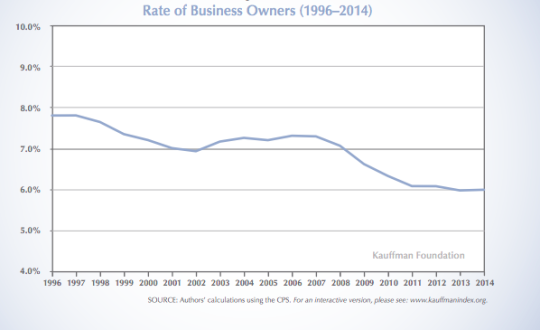 It shows that the rate of business owners nationally has actually fallen by over 20% since 1996, with an even more precipitous decline in 2008. So first of all, more startups weren’t created after 2008. Dramatically fewer were. And while new business formation has rebounded since 2008, it is still lower than it was 30 years ago. 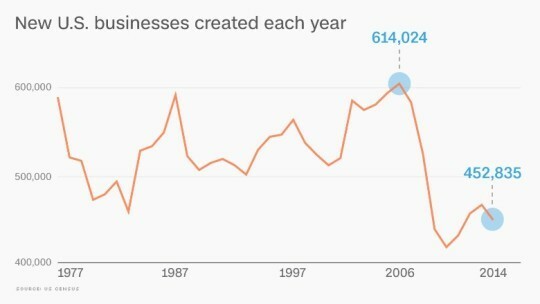 But take a look at the chart below, from the U.S. Census Bureau, and you’ll see that, in fact, new business formation in the United States is at a 40-year low! while there is more money than ever in VC there is also more risk aversion and less independent conviction. stranding many companies that are building solid businesses in “out of favor” markets or in markets where “venture scale returns” are not a straight line path. Word. In fairness to venture capitalists, liquidity has been particularly hard to find lately, which may be affecting how they think about deploying their capital. The hive mind is more intense in venture capital today than it has been in my 7 years in the business. Valuations have been blown out of proportion among “fundable” companies, while those with promising but early trajectories, those with ambitious but workmanlike metrics, are perennially struggling to raise capital. My favorite quotation to capture this phenomenon is: deals these days are badly undersubscribed until it is badly oversubscribed. Second of all, the United States is in a period of possibly the most intense consolidation in the innovation and technology ecosystems since the 1870′s –– when, in an effort to entice European businesspeople and workers to the United States, *massive* government contracts were granted to corporations to fund expansion of the United States project, leading to the passage of the Sherman Antitrust Act in 1890. Look at the top companies in the United States by market capitalization: if you take out oil companies and investment corporations, you have Apple, Google, Microsoft, Facebook, Amazon. Semil Shah covered how their presence affects startup investing (https://stratechery.com/2016/how-fangam-impacts-startups-how-startups-adjust-to-fangam-investing-in-a-fangam-world/), but it’s worth noting that the phenomena that have lead to these companies’ massive, immense success is not isolated to them. The network effect, and the focus on consumer surplus as a means of crowding out competition, is endemic to the software-enabled innovation company today. Competition and capitalism are actually not compatible, as Peter Thiel might say. And network effects, focused on consumer surplus, scalable demand generation, and very thin aggregation of crowds, are a *really* good manifestation of capitalism. Why start your own private practice, when economies of scale make lifestyle better to be part of a network? How do you open a small business when a big network-based company is offering a cheaper service? How do you find an edge in technology spaces that require data, when the incumbents have all the network effects and incredible expertise in attacking adjacencies? Finally, given both of the former two points, there is a broad-based misunderstanding about startup formation today. People say: “Cloud-based services make it easier than ever”. “Pre-seed capital invests earlier”. “More funds than ever before”. But the truth is, the *vast* majority of capital that invests in startups comes after the critical period that matters most for startup founders: the “friends & family round”… the “just bootstrap it” round… As we all know, most Americans can’t afford an unexpected expense of $400. And as I’m sure most of us can intuit, the ability to raise a “friends and family round” is not evenly distributed according to talent. So taking a year, 6 months, or even a quarter, to quit your job and start a new business is simply a nonstarter for most Americans today. In a world where the small business bank loan has all but evaporated (particularly post-2008), many Americans – and others around the world – aren’t starting companies because they just can’t afford to. When we talk about diversity in tech, I’m interested in hearing about the structural impediments to startup success. Ultimately, many of them can be boiled down to access to capital. Large, urban coastal centers are attracting capital and resources aplenty, while mid-sized and middle-of-the-country towns are not keeping apace. Within those urban coastal centers, wealthy, well-connected, mostly white males are raising more and more capital at higher and higher valuations, while other demographics are not keeping apace. Even within the demographics that overindex in startup formation, there is a very strong sense of “haves” and “have-nots” which is intensifying, even in the midst of a lot of noise about diversity and startups. This is pushing inequality further, slowing our ability to innovate writ large, and keeping too many Americans outside of equity participation in this country. Economists across the political spectrum will agree that new job growth comes from new business formation. And businesspeople of all stripes will tell you that equity upside is the most important input for building wealth. This isn’t just a matter of building cool technology – though that is impacted, as well – this is a matter of how nations can grow to be healthy, and supportive of their citizens. I was pleased to read Sam’s post American Equity yesterday, as its clear he recognizes the same issue I do. The central planning and policy-prescriptions for this issue should range from ideas like his, to the varying universal basic income (UBI) concepts, to investing in incentives for banks to lend for small business formation. All of this is good. But the market driven approaches will need to supplement these – frankly, the central planning approaches will need to supplement the market driven approaches. And this starts with recognizing where we *actually* are. I’ve spoken to too many people in the tech world who say there are “too many funds” or “not another app”. Quite the opposite, if you ask me. They are the among the only lasting advantages in business – particularly in the fast-moving technology environment. And the question about how to grow one is one of the most common pain points for someone early in their career, particularly if they did not get lucky and choose the right company to work for, where the network was built-in for them. So here’s a word: most people wrongly focus on the “network” side of the equation before the “proprietary” side. It’s relatively easy to guess somebody’s email address. And it’s a toss up who will respond to a cold email. It’s relatively easy to meet a luminary – attend the right conference, hang around after she speaks, you may get 5 minutes. But if you do this before the “proprietary” part, you’re getting it backwards. Proprietary, in this context, means you are known *for something*. You are useful, have an expertise, or even simply a well-researched interest somewhere. If you reach out to me as someone generally interested in getting ahead, why do you stand out over any other person who shares that desire? But if you are yourself an expert, or have a truly differentiated point of view, then it’s a different game – you’ll often find they actually want to meet you as much as you want to meet them. If you want to build out your network, step one: stop networking. Practice thinking independently; reading, writing, and building. Become the most interesting person in your field. In an influential 1979 behavioral economics paper, Daniel Kahneman and his colleague Amos Tversky developed “Prospect Theory” as a way to make sense of decision-making. The summary of the paper was, if I may, that humans do not make optimal decisions, which normative (”should”) frameworks suggest, but instead have irrational aversion to certain losses, and minimize the probability of other losses. Here, Kahneman (via Thinking, Fast and Slow) outlines the cases where a decision-maker irrationally minimizes potential losses versus maximizing potential gains. As the theory goes, humans sometimes choose to be risk-averse, even it results in an unfavorable outcome. The opposite also applies: we sometimes are risk-seeking even if it results in an unfavorable outcome. The intersection of actuarial science and behavioral economics purports to find itself in the bottom right box. You choose to buy insurance, which is $1 more than the statistically-adjusted cost of “going for it” because of the fear of losing $10,000. At least, that’s how the model suggests it would be, right? The insurance policies that people buy often fall into two categories. One: mandated by law, with scary non-adherence implications; two: mandated as a means to accessing something else you really want, like a house or an apartment. Other than that, many consumers choose to wing it, either because there are short term cash needs which appear more pressing, or because they believe it “wouldn’t happen to them”. These behavioral quirks in our psychology are really important for insurance tech companies to study, and learn well. Insurance tech is very “hot” right now. Many startups are thinking about the great ways that usage-based insurance, flexible and tied to smaller, more granular actions, can be more efficient, empowering, and consumer-friendly. They’re right. But we think we’re safer, healthier, and better protected than we are. So, a caution in designing your business model to account for what will likely be expensive customer acquisition. A caution in designing technocratic policies, especially if you’re going to model consumer behavior. Insurance is sold, not bought.